Hi there - Another Bellinghamster here- stumbled over from "Hooked on Crochet" and enjoyed looking through your blog - I'm impressed with all your patterns! Good work! Just love this pattern. Made one in a light purple for my neice. Will be making one for my granddaughter. I'm struggling with the dsgs. Do you have a visual of the technique please? The directions say to repeat every round until cap measures 4(4.5) inches from cast on edge. That includes the round where you scallop also? The picture does not look like there is 4 inches of scalloping. 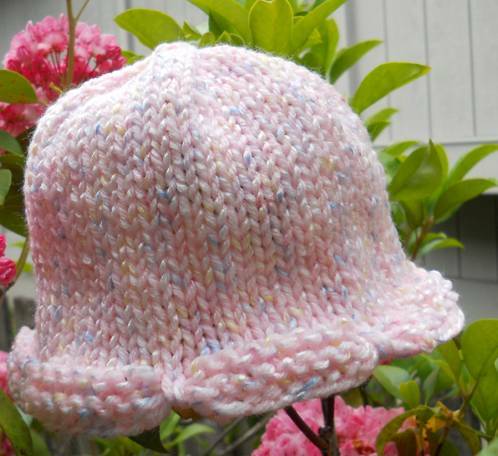 Love the pattern and want to do it correctly for my granddaughter. Thank you!! The direction say to knit not repeat until the cap measures 4 (4.5) inches.